The Monster at the End of this Book - As a kid I loved turning the pages no matter how much Grover pleaded that I didn't. My son loved this book as much as I did. 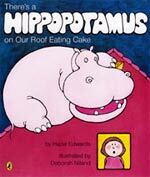 There's a Hippopotamus on Our Roof Eating Cake - My kids have loved all of this series of books. I think they love the 'silliness'. Mind you we have gone out several nights 'just to check' that there are no hippos on our roof. Too Many Monsters - Going off to sleep can me a torrid time for adults and children. Here is an interesting solution to 'There is a monster in the cupboard' It worked for us! Don't Take Your Snake for a Stroll - You've just gotta ham this one up as the kid causes chaos taking a snake for a walk. Super Snappy 123 - A fantastic first number book. Heaps of bright pictures and heaps of things to count together. Can I Have A Stegosaurus Mom - a nice variation on 'Can I have a pony?' 'Can I have a puppy?' etc. If you like this one there are a few others in the series worth a look. The Wide-Mouthed Frog - A beautiful pop up book with a nice little bit of humour at the end.